On your marks! More than any other narrative field, graphic storytelling is determined by beginnings. Case in point: 2012 saw the newest in a long line of reboots, as DC comics renumbered and restarted its series and its universe. It is not just the context of serial superhero stories, however, that is characterized by ›beginnings‹ and ›renewals‹ – any historical perspective requires both comics and comics studies to re-examine the question of beginnings. 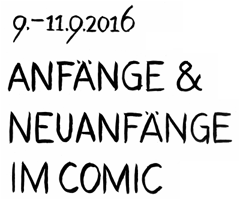 The conference, held on September 9-11, 2016 in Kiel, Germany, will focus on the themes of ›beginning‹ and ›renewal‹ in comics, seeking a wide range of interdisciplinary approaches to the question of what constitutes a new start in comics and for comics. This includes ›beginning‹ as a formal device as well as related inquiries into the narratological, stylistic and theoretical implications of beginnings within the structure of comics. Further approaches include the question of beginnings of the medium, its discourses and the study of comics. Last but not least: ›beginnings‹, ›renewals‹ and ›fresh starts‹ will also be analyzed as themes and motifs. Attending the conference is free of charge and open to the public. Lectures will be given partly in English and partly in German (marked with and ). Arrival by bus: From the main station, take bus lines 61/62 (destination »Suchs­dorf«/»Projens­dorf«) or 50, 81 (destination »Bota­nischer Garten«) and leave at stop »Leibniz­straße« or »Universitäts­biblio­thek« to arrive at the main conference venue. To arrive at the Kunsthalle, take bus lines 41/42 (destination »Tannen­berg«/»Suchs­dorf«) from the main station and leave at stop »Kunsthalle«. See also the KVG website http://www.kvg-kiel.de/en/ for timetables and route maps. On Friday night, the conference opens with a comic book reading at the art gallery in Kiel. Four comic book artists – Tanja Esch from Hamburg, Jul Gordon and Sascha Hommer (Kontaktcenter), and Gregor Hinz (comic magazine Pure Fruit) – read from their respective works, thereby approaching the topics of ›beginnings‹ and ›renewals‹ from a performative perspective. Free admission! Short-term programme changes are marked with (hover for further information). The year 1979, the International Year of the Child, is a decisive date in the history of Bulgarian comics. It saw the publication of the first issue of Дъга/Rainbow, a comic magazine initiated by the authorities, in particular by the minister of culture Ljudmila Zhivkova, daughter of Bulgarian leader Todor Zhivkov. The comic appeared in the following 13 years and was quite succesful: The 42 issues (each with 48 pages) had an average edition of 150,000 copies, and were overall sold 6.5 million times. The economic succes financed the luxurious editions of ideologic propaganda literature. Never before and since have Bulgarian comics enjoyed such an enormous popularity. In contrast to other comic magazines in Eastern Europe before the fall of the Berlin Wall (for example Mosaik in GDR) Rainbow contained predominantly concrete, national historical subjects with heroes from the older and more recent Bulgarian history, with the aim to create in whatever form a robust Bulgarian identity. Remarkable are the topics dealing with Bulgaria’s recent past, especially with the partisans in the Second World War. Particularly interesting is the six-episode-serial Безсънни нощи/Sleepless nights, whose plot begins with the days shortly after the »Socialist Revolution of 9 September« in 1944. It is about the founding of a National Secret Service, the assumed essential fight of the new state against »counterrevolutionary, fascist gangs«. Several aspects of this comic serial are surprising. First of all it is the surprising choice of the topic ›National Secret Service‹, which is probably by far less popular than civil partisans or even heroes from areas like chivalry, the Wild West or science fiction. Then one has to realize the multiplicity of mistakes the heroic agents make in their adventures, contradicting in such way the official ideological interests of the publisher. The agents arrest a friendly Soviet spy by mistake, they attack a monastery without any precautions and many of them get killed, they are not attentive while guarding murderers, personal revenge sometimes wins over rational appeals, etc. Furthermore, the open ending of the last episode points quite openly to the fear and distrust towards the agents among the ›ordinary people‹. When Major Dimiter Stefanov, who increasingly becomes the focus of the episodes, is confronted with this scepticism, he is deeply shattered and doubts begin to gain upper hand. – The panel architecture of every page is quite well developed. Creator Konstantin Georgiev’s dynamic action scenes with their many painstaking details, are obviously strongly influenced by his western idols. Given these elements, it seems rewarding to have a look at the beginnings of this completely unknown comic story – the beginning of a new system of a government and its self-affirmation and at the same time the beginning of a new artistic expression, the Bulgarian comic. Does it possess the subversive, critical potential that Ole Frahm ascribes to every comic? The title of the second episode Това беше началото/This was the beginning describes already on the first page the fatal misjudgements of the heroes and a walk into the unknown, setting the fundamental tone for the six episodes. The historical memory in Spain has been the focus of intense discussion in all sectors of Spanish society for the last few years. Cartoonists and graphic artists also participate in this heated debate with, among other material, personal experiences during the Spanish Civil War (1936-1939) and the first few years of the consequent dictatorship. In this essay I will focus on a series of six graphic novels published between 2005 and 2015, a period in which, perhaps because the survivors are slowly disappearing, the cultural production concentrating on the Civil War is at its peak; a peak that becomes far more evident in the comic books, which were not until recently a common medium in Spain to represent the Civil War. All graphic novels that deal with the Civil War in the last decade approach this event in history through the testimony of one of its protagonists. The decision of the authors, whom all belong to post war generations, to recreate history through the personal account of those who experienced the Civil War in first person is not trivial: as readers, we receive the account from a character who witnessed the events in first person, and this adds veracity and legitimacy to it. At stake is the value of the stories we are reading as legitimate sources of historical knowledge. The legitimization of these stories is determined by the starting points of the stories. It is, with one exception, at the beginning when the authors choose to establish the authority of their stories as a truthful exercise of memory. The use of explanatory paratextual elements, iconic historical moments and the explicit transmission of the testimony to post-generations are some of the formulas used by the authors to claim truth. The current promotion of die Graphic Novel as flagship of the German comics industry marks the latest attempt at renewal in a field of production (to use Bourdieu’s terms) that has always been marginalized relative to the greater economic, cultural and symbolic significance of comics in other countries. Similar fresh starts, or false starts, have occurred regularly since 1945, with (for example) the rise of a small and undercapitalized indigenous comics industry in (West) Germany in the 1950s; the entry of import-dominated multinationals into the market (beginning in the 1950s, but acquiring momentum in the 1960s); the adoption of underground sensibilities in the 1970s; the large-scale expansion into bande-dessinée-style albums through the 1980s; and after a massive post-reunification market contraction, the embrace of Japanese manga in the mid-1990s. Despite these recurring attempts to place the German comics industry on a firmer footing, the market remains surprisingly small and fragmented. The graphic novel, however, which the publishers appear to take seriously not merely as a marketing term, but also as a form capable of genuine cultural consecration, may yet open the market to a broader, more sophisticated adult readership. This would indeed be a triumph for an industry that has frequently been described as having a history, but no discernible tradition. In this talk I will argue that better integrating the Werbecomic, as the origin of a truly indigenous and long-lived German comics tradition, into German comics historiography would offer a more accurate, longer-term, and better balanced view of the unique development of the comics form in the German-speaking countries. Caricature and satire have played, since the 18th century, a crucial role in British visual culture. Since William Hogarth, satirical prints contributed to provide a deep insight of public and private life and dealt with a number of social issues. Within this context, texts such as captions, titles or speech balloons importantly contributed to enhance the message that comics conveyed. Art historical research has broadly demonstrated that narrative and visual are therefore indissociable and that comics rely on both written and pictorial spheres. The modalities of this interaction are as wide as the subjects they deal with: social, moral, political and economic topics are much sought after fields and offer ground to develop a diversity of narrative supports. British visual culture fundamentally contributed to this textual/visual duo because it rapidly triggered a need for images and the rise of print culture. Art historians have investigated this relationship with regard to the development of comics in general or focussing on particular case-studies on satirical artists. Yet little has been done on the mechanics of this relationship and more specifically on the diversity of backgrounds, reasons and contexts which led to the rise of narrative in 18th-century British comics. The purpose of this talk is precisely to investigate this ›beginning‹ and to study the motivations of its genesis. I will demonstrate that this relationship written/visual works as a catalyst for questioning the function of comics. I will argue that the text inserted into a strip is not only a corollary of the image itself. To the contrary, it helps to create, reject or reshape their message and gives therefore a hint of the communicative role that these objects played. In a first instance, I will focus on the reasons which led the insertion of texts in comics. Particularly, I will discuss the mechanisms which led to the development of captions, speech balloons and and bubble thoughts. From the 1730s onwards, publishers were expected to indicate, in their prints, relavant details such as the name of the author. This basic information evolved through the 18th century and text became increasingly important in comics. Secondly, I will show that the possibility to insert a wide range of texts provided artists and publishers with a multitude of tools to approach satirical imagery. It also allowed a questioning of the images’ moral, cultural, aesthetic, social, political and economic values. This questioning initiated a narrative function which strongly contributed to the development of comics. I am interested in the rise of this function and in understanding to what extent it affected both the materiality of images and their consumption. Game over – the game is over, the last decision was fatal, the character is dead. In videogames, such a »Game over« signifies only a reset; the end constitutes a new beginning. What if in real life as well, every death would mean merely a return to the previous crossroads, a chance to reconsider decisions and take them more consciously than before? Does the presence of death create a new reflection over life? It have been questions like these Fábio Moon and Gabriel Bá were confronted with, when creating the comic-book Daytripper. It tells the fictitious life of Brás de Oliva Domingos, which ends lethal in every single chapter, only to find a new beginning in the following one. »Daytripper is an honest mediation about mortality« states Craig Thompson in the preface of the book and because of this, the whole book is to be read as a philosophical challenge to see a new beginning in every ending. Throughout the book, Brás, the protagonist, dies in eight out of ten chapters (mostly because of an accident). In contrast, the two final chapters subsume the philosophical message of the book without lethal ending. Told as a dream of elderly Brás, the last but one chapter reflects the storyline as a whole. The recipient re-experiences many episodes again, when alternatives are provided and explanations are given. Daytripper combines the serial approach of comics with ways of alternative storytelling in the recurring motive of death with subsequent reboot. This »Game over and reset« is graphically tagged: After the death of the protagonist, the book continues with two full-page panels that announce the upcoming chapter. The first one has bright lucid colors with strong contrasts; the second one is modified in an oneiric way by soft focus and sepia tones. All chapters interweave in form and content, so that the repetitive reboots merge in intratextual links. Not only continues the story with every new chapter, but an alternative storyline is introduced (originally every chapter was a separate issue). The presentation tends to trace the seriality of the plot and to unleash further intermedial links, supplementary to the previously mentioned »Game over and reset«, known from videogames. In film, for example, dreams are esthetic configurations to create alternative storylines, which applies in the last but one chapter of Daytripper as well. To conclude, the talk targets on the narrative and visual strategies Daytripper uses to create seriality that go beyond the identity of the protagonist or the variety of episodes. It seems that the seriality is established on a higher level, namely through the motive of fatal decisions in life. Every new comic book series starts with a no. 1 issue and every one of those issues starts with its first page. This first page can serve many functions. It can introduce important elements of the plot or characters, it can establish a new environment or new rules for the latest reboot or it can just tease what is to come. Considering the incentive by its publisher to re-start an existing series with a new no. 1, we have to consider how that start is conceived. What is the intention behind the reboot? Should experienced readers be motivated to pick up a series again that may have fallen out of favor? Or does it serve as an introduction to new readers? How much can a no.1 and its first page rely on references to the past and how much does it have to deliver something new? The first page in comics has a similar function to a first paragraph in a novel or the first shot in a movie. Though it doesn’t completely decide the audience’s decision to continue with the story, it still is the very first impression for what is to come, laying the first brick for the story’s groundwork. It sets the parameters for this version of the series or the character. In my talk I want to discuss several first pages of first issues for specific characters. Characters like Captain America, Green Lantern or Wonder Woman have seen several iterations in their history. While it is common to have changing creative teams, some characters undergo more complete reboots than others. Spider-Man or Batman have kept their numbering for most of their runtime, while other characters have been reinvented again and again, like the Punisher who has accumulated at least eleven no. 1 issues in 30 years. I want to focus on what each first page of each reboot tells the reader. In the cases of Iron Man and Captain America for example, you see a certain kind of evolution just by looking at those first pages. For Iron Man you not only see an evolution in the character’s own technology he is using but also the world around him becoming more reliant on technology, reflecting the role the character plays in the world as an inventor. The first pages for Captain America depict changing political climates that center around the idea of what being American means, while in more recent first issues, the first pages become more personal stories about the people who fill the role of Captain America. The first pages of the Avengers series are connected by a sense of their own mythology, while the seven reboots of Aquaman start in surprisingly similar fashion. Der Comic Building Stories von Chris Ware ist ein Konvolut aus mehreren, verschieden groß gebundenen Heften, Bögen und Karten, die in selbst gewählter Reihenfolge gelesen werden können oder vielmehr müssen. Ein Anfang wird nicht angeboten, auch wenn sich über die Biographie der Protagonistin eine narrative Linie ziehen lässt und sich die Hefte auch annähernd in eine chronologische Reihe bringen lassen. Zeitliche Überschneidungen und Wechsel der Erzählperspektive lassen eine eindeutige Reihung indessen unmöglich werden. Die Erzählung der Biographie setzt mit jedem neuen Heft gleichsam immer wieder neu an, und jedes Heft setzt zudem immer wieder anders mit der Erzählung ein: mit einem anderen Format, einem anderen Genre oder einer anderen Perspektive. Jedes Heft markiert so einen jeweils neuen Anfang, um von der Biographie das gleiche anders oder auch ganz anderes zu erzählen und stellt auf diese Weise zum einen die spezifische Form von komplexen Erinnerungsprozessen aus, die ebenfalls von zahlreichen Neuanfängen um ein Geschehen herum geprägt sind, und zum anderen den Konstruktionscharakter von Geschichten. Der Vortrag möchte Building Stories in drei Hinsichten beschreiben. Erstens verfolgt er die These, dass es sich bei diesem Text um ergodische Literatur handelt. Mit diesem Begriff beschreibt Espen J. Aarseth in Cybertext jene literarischen Texte, die materiell keinen Leseweg anbieten, sondern in der Lektüre eine Entscheidung über den Textverlauf erforderlich machen. Es soll gezeigt werden, inwiefern dies auf Building Stories zutrifft, aus welchen materiellen Elementen die Textgrundlage besteht und welche Konsequenzen das für die Lektüre hat. In einem zweiten Schritt soll dann in einer narrativen Analyse untersucht werden, welche Anfänge in den einzelnen textuellen Elementen gemacht werden: Welche narrativen Stränge eröffnen sie und wie stehen diese in Bezug zu den übrigen Erzählsträngen? An welchen Punkten in der Geschichte wird jeweils eingesetzt, und was markieren diese Einsätze? Welche Perspektiven werden jeweils eröffnet, und wie werden die Anfänge in den unterschiedlichen Genres gestaltet (Erzählung, Journal, Kurzgeschichte)? Schließlich soll in einer formalen Analyse die Panelstruktur sowie die comicspezifische Perspektivierung der textuellen Elemente in Bezug zur bisherigen Analyse der narrativen und materiellen Anfänge gesetzt werden. Dabei soll deutlich werden, dass auch die Anordnung in Splashpages oder auch anderen panelübergreifend gestalteten Comicseiten das Festlegen eines Anfangspunktes verunmöglichen. Hierzu werden auch die öfters verwendeten Übersichtskarten und Hausquerschnitte in den Blick genommen, also die Verschränkung von Karten- und Comicform. Ziel des Vortrages ist es damit insgesamt zu zeigen, wie in Building Stories durch die medialen Bedingungen als ergodische Literatur, durch die Organisation der narrativen Stränge und durch das spezifische Forminventar des Comics die Konstruktion von Geschichten (›building stories‹) selbst thematisch wird. Die Anfänge von Geschichten, so zeigt dieser Comic, sind vielfältig, variabel und immer wieder anders möglich. Since its foundation in 1990 by comic authors like Jean-Christophe Menu, Mattt Konture, David B., Levis Trondheim, L’Association positioned itself as an anti-conformist, associative model of publishing, which aimed at questioning the current norms of the comic book market and understood itself as a fresh start in the French and international comic scene. The artists wanted to renew profoundly the comic book as such as well as its way of distribution. L’Association may be seen as a starting point for the broader changes in the French comic scene in the 1990s and the beginning of the 21st century. In this talk I propose to look at different aspects of what I will call the polemic aesthetics of L’Association related to the conception of the comic book. The general re-conception of the comic book is at the very beginning of the process of creation and opposes itself to the ›classical‹, ›commercial‹ model of the comic album. Furthermore, I want to investigate in which way the polemic aesthetics of the so-called la nouvelle bande dessinée situates itself between the pole of complete rupture with the ›past‹, with mass-production models and the pole of continuation of the Franco-Belgian and American avant-garde of the 70s. Finally, I want to briefly evoke the influence of the nouvelle bande dessinée on the German-speaking comic scene. As I have argued before, the publication format can have an influence on various levels of the creation of a graphic narrative. The research question of this contribution will be »to what degree the publication format influenced how opening sequences were narrated«. Therefore, openings of two different weeklies (Spirou and Tintin) from a particular period, the 1950s, will be compared. Both weeklies published every week installments of various continuity comics. The scope of my analysis limits itself to only new continuity comics created for the weekly (not foreign acquisitions, not gag comics, not already established series before 1950). While some publication format aspects (such as page dimension, weekly publication with a fixed total number of pages) were quite similar for both magazines, each weekly developed also some particular publication strategies, also in the case of beginnings of new comics. Contrary to Tintin where the first installment was limited to one page (just like the normal episodes), Spirou opted for larger beginnings (3 to 4 pages) than the weekly installments of 1 or 2 pages. The reason is probably that the editors of Spirou assumed with reason that it was more captivating for the reader. Furthermore, Tintin adopted the strategy to test out new characters (like Ric Hochet, Michel Vaillant, Strapontin) in short stories (of a few pages) before offering longer stories of these characters. Conventions had also their exceptions: while 4 or 5 tiers per page were still conventional in the weekly, an already well established artist like Jijé could suddenly use 3 tiers for his new western series (Jerry Spring). A few more detailed case studies (of La Grande Menace, Stanley, Kim Devil) will show also that more experienced authors could try out a less conventional start of their comic. Since about the turn of the century, a ›mangaization‹ of Japanese daily life has been observed. Television commercials, cooking books, PR brochures, street signs (hyōshiki), and even leaflets by government agencies and institutions seem to apply a certain ›manga-pictoriality‹ to convey all kinds of messages or information. Noticeable is not only the use of conventionalized manga-symbols (such as manpu-signs, such as keiyu-pictorial metaphors, or dōsen-speed lines), but also of corporate mascots and fictional representatives of towns, prefectures, sights and government institutions. Also, legions of nameless ›working characters‹ can be found on street signs, tax forms, instruction manuals, in post offices, corner stores or supermarkets; all these ›characters without stories‹ are usually addressed as kyara, distinguished from kyarakutā. However, it is not with recourse to ›classic‹ minimal criteria of ›comicness‹ that a differentiation to common pictograms seems possible (for instance, by the aspect of multimodality of text and image, or by the aspect of pictorial sequenciality). According to influential manga-theorist Itō Gō, even single still pictures of manga apply a very special kind of pictoriality that can be clearly differentiated from ›actual‹ pictures: the character-iconographies of manga (kyara-zuzō), usually based on line-drawings (senga), can be distinguished »by a clear conceptual boundary« from icons, pictograms, or even various forms of illustrations, in that they seem to transport a special presence or life force. To Itō, the representations of kyara imply a certain life of their own, a »presence of identity« beyond the visible represented moment or scene. Usually, we would not consider the pictures on traffic signs, pictograms, emoticons, or various other kind of info-graphics as representing particular individuals, living in some fictional domain independent from their selective representation. I’d like to discuss this aspect of pictoriality as the base-narrativity of comic- and manga-pictures. This base-narrativity consists not in the much-discussed problem of representing temporality or changes of states within a static medium. If we consider narrativity as a »fuzzy set« of heterogeneous representational aspects found inside and outside of prototypical stories (or, rather, in the comprehension of such artefacts), the represented situation must be seen as their fundamental core. Even single-picture-cartoons would then be considered narrative, in so far as they allow for a »referential meaning«, a representation of individuated particulars within some possible world. Mary-Laure Ryan also considers »a spatial constituent consisting of a world […] populated by individuated existents (characters and objects)« as the minimal condition for narrative representations. Things that possess an extensional spatial identity must then be thought of as possessing an identity in time as well, whether represented or not. In this respect, the pictures of comics and manga can be clearly differentiated from pictograms, but also from many illustrations in dictionaries that only signify classes of objects, where we usually are not »willingly engaging in a game of make-believe in which we pretend that there is a spatio-temporal domain in which [a character] and his ›world mates‹ exist and act independently of and prior to any narrative about them« (Uri Margolin). My contribution investigates how this semiotic ›habit of interpretation‹, strongly connected to manga-pictoriality and essentially triggered by it, is put to use in everyday communication. The visual is a constitutive part of social presentation, storage and mediation of knowledge. The role of the visual for generating knowledge in the academic field is nontheless highly discussed. As Ferdinand Deligny remarks, we are still in an age of language, even if we come across more and more pictures in daily life. In contrast to this view, I claim that pictures can be used as a method of research. The main emphasis will be on the medium comic. I aim to show the potentials of visual thinking and thus how the visual shapes notions, that cannot be fully grasped by conceptual thinking. A visual education that underpins the visual form of knowledge generation attributes the images not only an illustrative character but an argumentative one. This brings this idea in close relation to practices of artistic research whose basic idea is an equal relationship between artistic practice and theory. The investigation does not aim at art itself but at investigating through art and its own specific – often not primarily conceptual – processes. It is here always in relation with theory which mediates its ideas particularly in language. Nick Sousanis’ dissertation in comic form, Unflattening, presents an actual forerunning example for the aforementioned. In designing this experiment in visual thinking which explores different ways subjects see and construct knowledge. The whole dissertation being completely in comic form connects theory and practice. Sousani uses the possibilities of the medium comic to create a collage of images in a rarely strict linear way. Sousani’s abstract drawings open up to the viewer as visual references, allusions, allegories and motives which he contrasts to the academic demands on cogency and clarity in the argumentation. The problem of beginnings is presented on each page not only to Sousanis but also to his readers/viewers. His procedures show the idea of an nonlinear tangential thinking movement. He benefits from the possibilities which the space of a page gives him and connects his thinkings in various ways. During the reading or vieweing of the comic, the subject can jump around the page without being reduced to only one course in time or in space, as it is suggested in film or text-based media. Text and image can influence each other and show new ways of seeing aswell as amplify existing ways through their combination. In continuation of visual thinking’s value for academic research, a prospect for eduactional contexts is being realised in this presentation. The meaning of visual literacy is of ever greater necessity for teachers, students and pupils. The revelation of different ways of seeing – and therefore thinking – cannot only change the form in which we write and communicate, but also extend the ways in which we perceive the world. The lecture is going to show furthermore the chances for humanity research and educational purposes which are initiated through an extension of conceptual academic practices towards visual practices. This conference would not have been possible without the support of the Dean's Office of the Faculty of Arts and Humanities, the Graduate Center of Kiel University, and the Fritz Thyssen Foundation. Special thanks are due to Marleen Krallmann and Nora Grunwald for creating the illustrations, and to bookstore Zapata in Kiel for providing the books for sale at the conference.